The University of Dubuque volleyball team continues to take strides in becoming one of the consistent performers in the American Rivers Conference. The Spartans have taken top-ranked opponents into five sets and have proven a tough opponent for all they face. Expect to compete in several tournaments while traveling to some of the best indoor venues in the tri-state region. The Spartans are named to the All-Tournament team in nearly every tournament they compete in during the fall season. UD plays an offense which spreads the ball around giving opportunities for many student-athletes to contribute during the season. UD won the first ever Iowa Conference Team Championship with a perfect 6-0 record in 1982 and also won the team title in 1995. UD finished second in 2018 and won the American Rivers Tournament to earn a bid into the 2018 NCAA Division III National Championships. The Spartans have qualified for four NCAA Division III Championships. If you're interested in playing volleyball at the University of Dubuque, complete the prospect form, and a coach will be in touch. 1 Jenna Runde Libero 5-6 Senior Elgin, Ill.
3 Kara Wright Outside Hitter 5-10 Junior Stockton, Ill.
7 Bre Cullen Outside Hitter/DS 5-7 Junior Chana, Ill.
8 Kate Messino Setter 5-7 Freshman McHenry, Ill.
10 Kendall Kaufmann Outside Hitter 5-9 Senior Sheridan, Ill.
14 Isabel Cleary Outside Hitter 6-1 Sophomore Bismark, N.D.
16 Maddy Cruz Outside Hitter 5-10 Sophomore Chicago, Ill.
20 Paige Harbort Middle Hitter 5-10 Junior Janesville, Wis.
21 Chloe Olson Middle Hitter 5-10 Sophomore Longmont, Colo.
22 Hailey Wills Outside Hitter/DS 5-6 Freshman Galena, Ill.
25 Emily Dlugosz Outside Hitter 5-8 Sophomore Lockport, Ill.
27 Sarrah Farraday Outside Hitter 5-8 Junior Wheaton, Ill.
28 Kenzie Hillis Outside Hitter 5-8 Freshman Calumet City, Ill.
29 Lauren Tucker Outside Hitter 5-8 Sophomore Lancaster, Wis.
35 Lacey McMillion Outside Hitter 5-9 Freshman Moline, Ill.
36 Katie Hummel Opposite Hitter 5-6 Freshman Knoxville, Ill. Played in 23 sets over the course of 10 matches. Appeared in six sets over four matches. 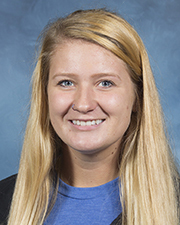 April Elsbernd joined the University of Dubuque Athletic Department in the Spring of 2009 and is a native of Calmar, Iowa (South Winneshiek High School). The 2018 season will be her 10th season with the Spartans. University of Dubuque Volleyball student-athletes have earned 53 IIAC All-Academic individual honors, accounted for nine straight American Volleyball Coaches Association (AVCA) Academic Team awards, and ten All-IIAC selections during her nine seasons at the helm of the program. During the 2017 season, the Spartans secured a 3rd place finish in the Iowa Conference and a quarterfinal victory in the IIAC tournament behind Honorable Mention All-American, Karrah Davis. They finished the season with the most wins since 1995 (28-7), and began the season with a 12-0 match winning streak. Prior to coaching at the University of Dubuque, Elsbernd spent one season as head coach at Iowa Central Community College in Fort Dodge, Iowa; and three seasons as an assistant at Cornell College. She attended and played collegiate volleyball at Coe College from 1999-2002 and graduated in 2003 with a Bachelor of Arts degree in Sociology, Public Relations and Speech Communications. She was a four-year letterwinner and earned Academic All-Iowa Conference honors in 2001 and 2002. Elsbernd has experience coaching at numerous volleyball camps and clinics, and has been involved with the USAV Iowa Region High Performance program since 2011; learning from and interacting with USA Volleyball coaches and USA Olympic Athletes. In addition to her role as the head volleyball coach at UD, she is an adjunct instructor for the Health, Wellness and Sport department and the First-Year Experience department. She has also had the opportunity to travel abroad (Italy, London, Paris, and Costa Rica) with a number of undergraduate courses. 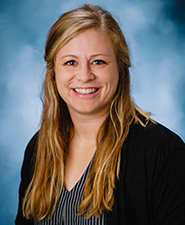 Elsbernd graduated with a Master of Science degree in Sport Administration from the University of Wisconsin – La Crosse in 2007; and is currently working on her Ed.D in Educational Leadership from National Louis University in Wheeling, IL. 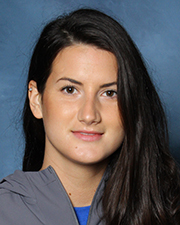 Milica Zmiric joined the University of Dubuque in 2017 as a Graduate Assistant of the Volleyball team. Zmiric is a native of Serbia where she was a member of the Serbian Youth National Team. After graduating high school she accepted to play at the College of Southern Idaho (CSI). That year in 2013 at CSI, they were the NJCAA National Champions. She then transferred to Lakeland College where she played for one season. While at Lakeland College, Milica helped them win their conference championship. She then continued her college athletic career at Chicago State University and the University of New Orleans. While at the University of New Orleans she was a member of both the indoor and beach teams. She received her degree in psychology at the University of New Orleans in December 2016. She will be pursuing her master’s degree in Business Administration at the University of Dubuque. The 2018 season was a historic one for the UD program. The Spartans went 24-9, won the American Rivers Conference Tournament Championship and earned the program’s first NCAA Tournament berth since 1998. The Spartans hauled in the conference awards for their performance in 2018. Kara Wright was named A-R-C MVP, Kate Messino was the A-R-C Freshman of the Year and head coach April Elsbernd was voted A-R-C Coach of the Year. Head Coach April Elsbernd led the Spartans to a 22-8 regular season record and a second place regular season finish in the American Rivers Conference, the highest finish in conference play since 1999. After receiving a first round bye in the A-R-C Tournament, the Spartans beat Coe in straight sets in semifinals before taking down Wartburg in four sets for the second time this season to clinch the A-R-C Tournament title. Kara Wright grabbed MVP honors after attacking her way through the A-R-C in her junior season. Wright led the A-R-C with 427 total kills and was second with 3.81 kills per set. Wright was more than just a force on offense; on the defensive end she was 10th in the A-R-C with 409 digs at 3.65 per set. She also added 62 total blocks, 13 solo and 49 block assists, good enough for second on the team. Kate Messino (McHenry, Ill./Marian Catholic) led the American Rivers Conference with 1212 assists for 10.10 per set to earn A-R-C Freshman of the Year. Messino ended the regular season tied for third in the conference in service aces and led the Spartans with 39 and pitched in 368 digs. Senior Jenna Runde joined Messino and Wright on the All-Conference team. The libero from Elgin, Illinois led the A-R-C in digs by a wide margin in the regular season, coming up with 584 digs, the next closest person in the conference finished with 455. She also dished out a team high 45 service aces and 105 assists, the second most of all Spartans. This is the second straight year Runde has earned an All-Conference selection. Rylee Andresen (Oxford Junction, Iowa/Midland) was the lone Spartan to grab honorable mention honors, earning her first all-conference recognition in her career. Andresen was a force at the net in 2018, recording 81 blocks, and the fourth most in the conference. Of the 89 blocks, 38 were solo and 51 were assists for a set average of .83. On offense, she had the fourth best hitting percentage of anyone in the conference at .257. Andresen had 246 kills on 637 attempts with just 82 errors mixed in. 2017 was one of the most successful seasons in school history, posting 28 wins, the most since 1995 when the Spartans had 37 wins and the fifth most wins in a single season in school history. The Spartans started the season with 12 straight wins; it was the longest win streak to start a season since the program’s second season in 1981 when they started 15-0. The 12 game win streak featured two 4-0 tournaments and a win over nationally ranked Cornell College on the road. UD finished Iowa Conference action 5-3, tied for third and earning the fourth seed in the Iowa Conference Tournament. In the Iowa Conference Tournament, UD swept Coe 3-0, for the second time this season, before falling to conference champion Wartburg College, 3-0 in the semifinals. Seniors, Alyssa Cose (Sherrill, Iowa/Hempstead) and Karrah Davis (Dubuque, Iowa/Hempstead), led the Spartans high powered offense which led the Iowa Conference in team kills and assists. Karrah Davis led all individuals in the IIAC with 472 kills and 4.58 kills per set. Alyssa Cose led the IIAC in assists with a total of 1152 and 9.76 per set. Cose had 170 more assists than the next person on the list. Junior and defensive specialist, Jenna Runde (Elgin, Ill./Burlington Central), played and started all 33 regular season games for the Spartans. Runde led the Spartans and was third in the Iowa Conference with 512 digs and 4.65 per set. DUBUQUE, Iowa - Senior outside hitter, Klaudia Basierak, added to her Spartan legacy by becoming the first University of Dubuque volleyball player to be named to the All-Iowa Conference team all four years and was instrumental in leading the Spartans to their best record (17-18) since 2007 and fifth-straight Iowa Conference tournament berth. Basierak and the Spartans claimed the sixth seed in the IIAC tournament thanks to a 3-4 IIAC record that included wins over Simpson, Buena Vista, and Central. UD was eliminated by Buena Vista on the road, 0-3, after defeating the Beavers earlier in the season. The IIAC tourney was a crowded field that concluded with three IIAC teams holding 4-3 records during IIAC play. Playoff seeding didn't get sorted out until the final matches of the year as the Spartans had an outside shot at the No. 2 seed. The Spartans claimed seed no. 6 after dropping their final bout to Loras. In a pivotal IIAC match early on, the Spartans fell in a five-set heartbreaker to eventual IIAC Champion, Wartburg, after holding two match points in the fourth set. In the following game, UD bounced back with their biggest comeback of the season over Buena Vista, 3-2, despite losing the opening two sets. The Hainesville, Ill. native moved up to second all-time in UD history with 1838 kills earlier this season and paced the Iowa Conference with 4.64 kills per set during IIAC play. Basierak was a workhorse at the net and holds UD’s all-time attacks record with 5,830 career attempts. The senior is also third on the career kills list for active players in Division III. Basierak registered 20+ kills and hit .300+ in nine matches this season, including a career-high 29 kills and nine digs in a five-set comeback against Buena Vista on the road. Basierak also added six matches of double-digit digs, was named to an All-Tournament team three times this season, and sits in the Top-10 nationally in both total attacks and kills in 2015. UD finished 12-13 during regular season tournament play that included a 2-0 showing at their Homecoming triangular. In her final season, senior Amanda Reetz compiled 179 kills with a .196 kill percentage, including a season-high 15 kills in win over Carleton. Sophomore Alyssa Cose split time with junior setter Hannah Zieser and paced the team with 660 assists. Defensively, junior specialist Kristin Wright claimed a team-high 558 digs and sophomore middle hitter Anna Runge led the IIAC with 128 blocks (0.99 per set) on the season. Front Row: Alyssa Cose, Elle Lannon, Rachael Schoepke, Kristin Wright, Marina Treto, Meagan Albon, and Amanda Reetz. Middle Row: Jordin Schnell, Sam Nielsen, Lauren Egnarski, Kelsey Wright, Audrey Flood, Amy Tranel, Kay Herbig, Olivia Larson, DreAna Heidenreich, Korissa Blasing, and Athletic Trainer Christine Roering. Back Row: Asst. Coach Rachel Ferguson, Student Asst. Jaci Lawfler, Tanasha Atwater, MiKayla Sigafus, Klaudia Basierak, Hannah Zieser, Jenny Greenwood, Karrah Davis, Anna Runge, Student Asst. Morgan Werkheiser, and Head Coach April Elsbernd. The Spartans clinched their fourth straight Iowa Intercollegiate Athletic Conference (IIAC) berth after finishing the season with a record of 12-24, 2-5 IIAC. Coach Elsbernd secured her 72nd career win, fourth-most in UD volleyball history, after the Spartans earned the sixth seed in the IIAC tournament. UD sprinted out to a 25-21 lead due to some tough defense, but later fell 3-1(25-21, 21-25, 21-25, 11-25) in the first round of the IIAC tournament. Junior Klaudia Basierak posted 14 kills while junior Amanda Reetz contributed 10 kills. Basierak, a three-time All-IIAC honoree who set the UD career record for total attacks (4,354) during the season, led a young, albeit experienced Spartan squad that listed just two seniors. Senior Amy Tranel was named to the Aurora University Jim Coleman Memorial Classic All-Tournament team from September 12-13 after boosting the Spartans to a 3-1 record. The Spartans would drop their IIAC opener at home, but bounced back with another 3-1 showing at the Ripon College Red Hawk Invite on September 19-20. Basierak's performance was worthy of a selection to the Ripon College All-Tournament team. Basierak anchored the Spartan front line to a pair of back-to-back, 3-1 IIAC wins, in early October with 15 and 18 kills, respectively. UD relied heavily on the sophomore contingent that led the team in various statistical categories throughout the year: S Hannah Zieser (978 assists), DS Olivia Larson (450 digs), MH Anna Runge (77 blocks), and DS Kristin Wright (2nd in digs, 423, and 2nd in aces, 38). Front Row: Whitney Teasdale, Kristin Henderson, Marina Treto, Becca Thiltgen, Kristin Wright, Morgan Werkheiser, and Anna Runge. Middle Row: Alyssa Sajnai, Audrey Flood, Katelyn Herbig, Any Tranel, Jordyn Gargus, Hannah Zieser, Jenny Greenwood, Abigail Johns, and Brianna Bautsch. Back Row: Caitlin Chiri, Molly Bohannan, Skylar Savage, Nicole Toro, Meggie Schmidt, Olivia Larson, Sam Nielsen, Caitlin Simbeck, Jen Pohlman, Holly Betke, Klaudia Basierak, Head Coach April Elsbernd, and Asst. Coach Rachel Ferguson. The 2013 University of Dubuque Volleyball team finished the season with an overall record of 12-21 and tied for fifth place in the Iowa Conference at 2-5. The Spartans lost in the opening round of the IIAC Tournament at Luther in four sets. Sophomore Klaudia Basierak (Outside Hitter) was selected 1st Team All-Iowa Conference. Junior Amy Tranel (Middle Hitter) was recognized as Honorable Mention All-IIAC. Basierak was named to all-tournament teams at the Beloit Buc Blast and Slagell Classic. Jen Pohlman earned all-tournament recognition at the Buc Blast while Katie Herbig earned the honor at the SMU Cardinal Invitation. Klaudia Basierak, Jen Pohlman, Alyssa Sajnai, Caitlin Simbeck, Becca Thiltgen, and Nicole Toro earned Academic All-Iowa Conference. Basierak was also honored as Captial One/CoSIDA First Team Academic All-District. The Spartans earned the AVCA Academic Team Award for the fifth straight year. Front Row: Caitlin Simbeck, Kyleeka Gonzalez, and Becca Thiltgen. Second Row: Amy Tranel, Zyra Gonzalez, Nicole Fein, Jen Pohlman, Molly Hohannan, and Susan Danielewski. Third Row: Asst. Coach Jenny Ewert, Nicole Toro, Alyssa Holt, Kristin Henderson, Meggie Schmidt, Ainsley Billesbach, and Jessica Serd. Back Row: Head Coach April Elsbernd, Katelyn Seitz, Katie Herbig, Jordyn Gargus, Audrey Flood, Alyssa Sajnaj, Klaudia Basierak, and Tiffiney Kavars. The 2012 University of Dubuque Volleyball team finished the season with an overall record of 15-20 and tied for fourth place in the Iowa Conference at 4-3. The Spartans lost in the opening round of the IIAC Tournament. Freshman Klaudia Basierak (Outside Hitter) was selected 1st Team All-Iowa Conference and named IIAC Freshman of the Year. Sophomore Meggie Schmidt (Setter) was recognized as Honorable Mention All-IIAC. Basierak was named all-tournament at the Beloit Buc Blast and Macalester Invite. Susan Danielewski earned the honor at the Wheaton College Invite while Schmidt was selected at the Loras Invitational. Nicoel Fein and Alyssa Holt earned Academic All-Iowa Conference. The Spartans earned the AVCA Academic Team Award for the fourth consecutive year. Front Row: Tiffani Gassman, Alyssa Holt, Zoe Page, Taylor Sobotta, Meggie Schmidt, Kirstyn Hines, and Caitlin Simbeck. Middle Row: Amy Tranel, Katelyn Herbig, Laura Menta, Sara Schutte, Carly Green, Chelsea Jones, and Lauren McKissick. Back Row: Head Coach April Elsbernd, Jessica Serd, Kristin Mortensen, Susan Danielewski, Kaitlyn Ramler, Lindsay Ellinor, Nicole Fein, Emily Kjos, Cail Botsford, Tiffiney Kavars, and Asst. Coach Jenny Ewert. The 2011 Volleyball team finished the season with an overall record of 16-18 and sixth place in the Iowa Conference at 3-5. The Spartans lost in the opening round of the IIAC Tournament. Junior Lauren McKissick (Outside Hitter) was selected 1st Team All-Iowa Conference. Senior Kristin Mortensen (Libero) was recognized as Honorable Mention All-IIAC. Lindsay Ellinor, Chelsea Jones, Lauren McKissick, Laura Menta, Sara Schutte, and Jessica Serd earned Academic All-Iowa Conference. The Spartans earned the AVCA Academic Team Award for the third consecutive year. Front Row: Kristin Mortensen and Tiffani Gassman. 2nd Row: Jessica Serd, Tiffiney Kavars, Lindsay Ellinor, Cali Botsford, Kirstyn Hines, and Erica Tedford. 3rd Row: Lilly Gors, Chelsea Jones, Laura Menta, Lauren McKissick, Whitley Phillips, Sara Schutte, and Carly Green. Back Row: LaShaila Thomas, Head Coach April Elsbernd, Asst. Coach Bryndon Paulsen, Asst. Coach Dana Serafini, and Susan Danielewski. The 2010 Volleyball team finished the season with an overall record of 6-26 and ninth place in the Iowa Conference at 0-8. Sophomore Lauren McKissick (Outside Hitter) was selected 2nd Team All-Iowa Conference. Junior Carly Green led the IIAC with a hitting percentage of .319. Lily Gors, Kristin Mortensen, and Whitley Phillips earned Academic All-Iowa Conference. The Spartans earned the AVCA Academic Team Award for the second straight year. Front Row: Susan Danielewski, Lilly Gors, Whitley Phillips, Carly Green, Bailey Abele, Sarah Gross, and English Ruffin. Back Row: Yaharia Lugo Ruiz, Hannah Stemo, Tiffani Gassman, Asst. Coach Dana Serafini, Kristin Mortensen, Head Coach April Elsbernd, Jessica Serd, Katelyn Herrman, and Kirsten Davis. The 2009 Volleyball team finished the season with an overall record of 11-22 and seventh place in the Iowa Conference at 2-6 for first year head coach April Elsbernd. Sophomore Kristin Mortensen (Libero) was recognized as Honorable Mention All-Iowa Conference. Lily Gors, Kristin Mortensen, and Whitley Phillips all earned Academic All-Iowa Conference. The Spartans earned the AVCA Academic Team Award. #1-Nia Calbreath, #2-Bethany Dwyer, #3-Keily Sasano, #4-Maxie Blasini, #5-Nikki Johnson, #6-Tiffany Hight, #7-Kristin Mortensen, #9-Stephannie Parsons, #10-Bailey Abele, #11-Whitley Phillips, #12-Kirsten Davis, #16-Katelyn Herrman, #17-Carly Green, #18-Lilly Gors, #22-Aja Brown, #24-Yahaira Lugo. Head Coach: Cole Tallman. Asstistant Coach: Taylor Foltz. The 2008 University of Dubuque Volleyball team finished the season with an overall record of 11-23 and eighth place in the Iowa Conference at 1-7. Freshman Carly Green (Outside Hitter) was recognized as Honorable Mention All-Iowa Conference. Freshman Tiffany Hight led the IIAC with 1.18 blocks per set. Lily Gors, Tashia Love, and Stephanie Parsons earned Academic All-Iowa Conference. Front Row: Lynn Nehl, Katelyn Herrman, Jena Goedken, Amber Rippentrop, and Stephanie Parsons. Middle Row: Chantel Basnight, Jessica Frederick, Karisa Sickels, Allie Spensley, Margarita Lopez, and Angela Christain. Back Row: Lilly Gors, Tashia Love, Whitley Phillips, Head Coach Cole Tallman, Rachel Spensley, Ashley Montavon, and Jayme Kalb. The 2007 University of Dubuque Volleyball team finished the season with an overall record of 18-17 and eighth place in the Iowa Conference at 2-6 under head coach Cole Tallman. Senior Jena Goedken (Middle blocker) was named 2nd Team All-Iowa Conference. Senior Amber Rippentrop (Setter) was recognized as Honorable Mention All-IIAC. For the second straight year, Goedken led the IIAC in hitting percentage (.312) and kills (618). Rippentrop set a school record with 1,625 set assists. Stephannie Parsons and Amber Rippentrop earned Academic All-Iowa Conference. #2-Jody Klepinger, #3-Jayme Kalb, #4-Brittany Goemaat, #7-Abbey Herrig, #8-Natalie Howard, #9-Stephanie Parsons, #10-Amber Rippentrop, #11-Ashley Metcalf, #15-Jena Goedken, #16-Katelyn Hermann, #18-Katie Feterl, #19-Ashley Karayannis, #20-Abbie Hillard, #23-Jessica Browning. Head Coach: Cole Tallman. Asstistant Coaches: Kristen Anderson and Carrie Erickson. The 2006 University of Dubuque Volleyball team finished the season with an overall record of 21-14 and seventh place in the Iowa Conference at 3-5 under head coach Cole Tallman. Junior Jena Goedken (Middle blocker) was named 2nd Team All-Iowa Conference. Goedken led the IIAC in hitting percentage (.454), kills (652), aces (87), and blocks (192). Senior Jessica Browning repeated as the league leader in assists per set with 13.38. Goedken set UD school records for kills, hitting percentage, and kills per set. Abbie Hillard, Stephanie Parson, and Amber Rippentrop earned Academic All-Iowa Conference. Jena Goedken was named 2nd Team ESPN The Magazine/CoSIDA Academic All-District. Hillard was selected 3rd Team ESPN The Magazine/CoSIDA Academic All-District. #2-Jody Klepinger, #5-Emma Orth, #6-Erica Adkins, #8-Natalie Howard, #9-Stephanie Parsons, #10-Amber Rippentrop, #11-Jodi Thomas, #15-Jena Goedken, #16-Dominique Wedig, #18-Katie Feterl, #19-Ashley Karayannis, #20-Abbie Hillard, #21-Taylor Foltz, #23-Jessica Browning. Head Coach: Cole Tallman. Asst. Coaches: Kristen Anderson and Carrie Erickson. The 2005 University of Dubuque Volleyball team finished the season with an overall record of 19-15 and seventh place in the Iowa Conference at 3-5 under first year head coach Cole Tallman. Seniors Jodi Thomas (Middle Blocker) and Taylor Foltz (Middle Blocker) were selected 2nd Team All-Iowa Conference. Foltz led the IIAC with a .404 hitting percentage while junior Jessica Browning led the league with 12.56 assists per set. Abbie Hillard, Amber Rippentrop, and Jodi Thomas earned Academic All-Iowa Conference. Thomas was also named First Team ESPN The Magazine/CoSIDA Academic All-District. The Spartans earned the AVCA Academic Team Award. Front Row: Natalie Howard, WynLyn Brunson, Michele Barkley, and Erin Nerison. Middle Row: Asst. Coach Lori Frick, Megan Lois, Abbie Hillard, Lauren Smalkoski, Emily Taylor, Amber Rippentrop, Erica Adkins, and Megan Klein. Back Row: Asst. Coach Greta Pemsl, Breanne Russell, Jena Goedken, Jodi Thomas, Taylor Foltz, Katie Feterl, Jody Klepinger, Asst. Coach Kristen Anderson, and Head Coach David Jackson. The 2004 University of Dubuque Volleyball team finished the season with an overall record of 13-22 and tied for sixth place in the Iowa Conference at 3-5 under first year head coach David Jackson. Senior Michelle Barkley (Defensive Specialist) and junior Taylor Foltz (Middle Blocker) were selected 2nd Team All-Iowa Conference. Barkley led the IIAC and set a school record with 746 digs. Taylor Foltz and Jodi Thomas earned Academic All-Iowa Conference.